Green juice drinks are all the rage because of their perceived health benefits. They can be an easy way to boost your vegetable intake and provide a good dose of nutritious vitamins and antioxidants, but there may also be potential side effects associated with too much green juicing. A healthy, balanced diet includes a variety of foods, including different types and colors of fruits and vegetables, so drinking juices made mainly from green vegetables may lead to nutrient imbalances. Many leafy greens are rich in potassium, so green juices may provide too much of this mineral for those on a potassium-restricted diet. On the other hand, while green vegetables are high in some things, they can be low in vitamins and antioxidants found in other fruits and vegetables. Most vegetables in general are low in protein and healthy fats, so unless you're eating a regular meal with or adding a scoop of protein powder and some avocado to your green vegetable juice, you may not get enough of those nutrients in your diet. The Academy of Nutrition and Dietetics recommends eating an average of 25 grams of fiber each day to help the digestive tract function normally. While vegetables and fruits are a good source of fiber, extracting and drinking only the juice leaves the beneficial pulp and fiber behind. A diet too low in fiber may lead to digestive problems like bloating and constipation. Additionally, large amounts of vegetable-based juice may cause problems like gas, bloating and diarrhea in some who are sensitive to certain types of fermentable carbohydrates found in greens like cabbage, artichokes, asparagus and celery. Certain leafy green vegetables like kale, arugula, bok choy and cabbage, can potentially interact with the thyroid. These cruciferous vegetables contain a compound that can interfere with iodine absorption, which is necessary for your body to make thyroid hormones. An August 2010 study published in "Cancer Causes & Control" showed that high consumption of cruciferous vegetables was associated with thyroid cancer among women with low iodine intake, and the Complementary and Alternative Medicine Guide from the University of Maryland Medical Center recommends avoiding certain green vegetables if you have hypothyroidism. It's best to check with your health care providers about what you eat or drink, especially if you have health conditions or take any medications. 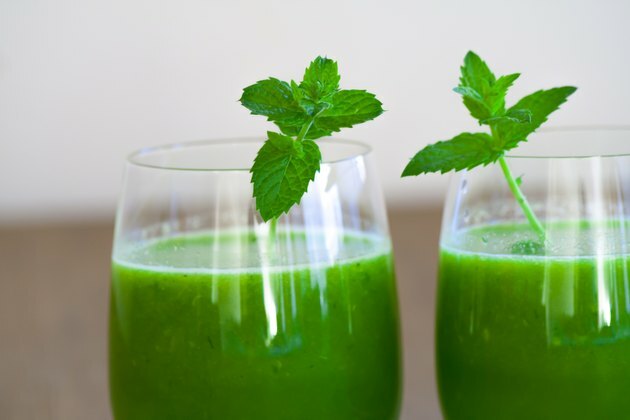 One of the reasons some people drink green vegetable juices is for weight loss, but relying on mainly vegetable juice drinks instead of solid food may also leave you light-headed and dizzy if you're not getting enough calories to sustain you. Juicing green vegetables can be a great way to boost your nutrition and lighten up, but make sure you vary the types of vegetables, add some fruit occasionally, and incorporate good sources of protein and healthy fats along with your juice.